Vienna and the Danube River. Numerous songs, stories and movies document the strong and lovely connection between Vienna and its river. This has, however, not always been the case. Over centuries the river remained a big threat for the city, and it took a lot of engineering to convert it into a leisure paradise. As a data scientist, I see many similarities to the big data deluge that hits many organisations, and the chance to streamline the power of big data to create a paradise for machine learning and artificial intelligence based on the right analytical platform. For millions of years, the Danube flowed 30 kilometres east of the place where Vienna is located. Then, however, the river dug a new bed between Leopoldsberg and Bisamberg and spread without barriers into multiple arms in the flat land behind it. I have seen some of organisations that got overwhelmed by the big data wave a couple of years ago. They were not prepared at all for the enormous amount of data that suddenly approached them. Do not move away from the data! 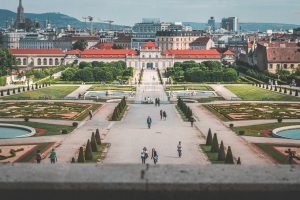 When Vienna was settled in Roman times and extended later on in the middle ages, the city centre was founded 2-3 kilometres southwest of the main Danube arms at a smaller, more controllable side arm. This happened for a good reason. No one wanted to live in the river area because uncontrollable floods were always a threat to houses and people. Some organisations still try to mimic this behaviour in the big data world. They stay away from their big data and hope that the using just a smaller portion of the data is enough for their business. Thus, hidden findings in their data remain undetected, and opportunities for relevant business decisions are lost. In the 1870s the municipality of Vienna decided to change the game. It planned and executed the regulation of the Danube into one major riverbed. Of course, this has been a major effort – planning, preparing, construction work in different phases – in order to finally present the Danube as one major river. I see many organisations today that are also working on projects to streamline their multiple data flows that sometimes flood the organisation and its processes. 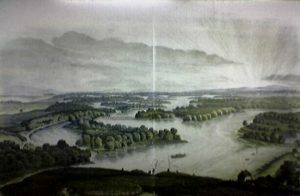 After the regulation of the Danube, the settlement behaviour of people in Vienna changed. People moved closer to the water. Areas that had remained untouched for centuries were now the focus of public interest and municipal planning. In data science, we want to achieve a similar behaviour. We want businesspeople and experts to move closer to the data. By offering self-service analytics with our platform, we give our customers tools to avoid getting flooded by data so they can benefit from it instead. In the 1970s, the city of Vienna even went a step further; the "Entlastungsgerinne" (backup riverbed) was built parallel to the Danube. The security consideration of this project was to build a second floatable river bed in case the capacity of the Danube was exceeded. We frequently see this in cloud environments today when customers desire to plug on/off data science computing resources as they need them. 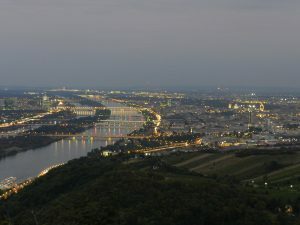 The 21-kilometre-long hill that was created between this riverbed and the Danube is called "Danube Island" (Donauinsel). Today this represents a leisure paradise for Vienna inhabitants and visitors in the middle of the city and offers swimming, sailing, surfing, water skiing, restaurants, bars and relaxation areas. Vienna converted the formerly dangerous area into a place where you want to be. Last year we ran a pilot project at a large insurance customer, and we provided SAS® Visual Analytics to the business experts. After meeting them two days later, one of the team members was extremely enthusiastic. He told us that formerly he was frustrated by the inability to handle the data, and now he can be in the "middle of his data" and enjoy the beneficial side of big data instead of being flooded by it. I think I should invite him to Danube Island in Vienna, as they have a lot in common. In the 1990s, finally, the power plant Freudenau was built. This adds another chapter to the city's paradigm change of dealing with the river. The power that caused deluges and problems 200 years ago is now used to light our city and makes Vienna an even better place to live. The deluge was finally converted into a great place to live and a great place to work. It is therefore a pleasure to see that our management has chosen the "Viertel Zwei" in the Danube area for our new SAS office location. We are now in the middle of a modern business quarter on formerly unlivable land. With this location, our new office expresses what we also do for business: We enable our customers to overcome the big data deluge and settle on land that was flooded and unstructured before. I look forward to meeting you in our new office at one of our next customer events. Or you could just pass by and meet me for a Vienna coffee and a talk about data science and machine learning. Dr. Gerhard Svolba ist Analytic Solutions Architect und Data Scientist bei SAS Institute in Österreich. Er ist in eine Vielzahl von analytischen und Data Science Projekten quer über fachliche Domains wie Demand Forecasting, analytisches CRM, Risikomodellierung und Produktionsqualität involviert. Seine Projekterfahrung reicht von der fachlichen und technischen Konzeption über die Datenaufbereitung und die analytische Modellierung in unterschiedlichen Branchen. Er ist der Autor der SAS Press Bücher Data Preparation for Analytics Using SAS, Data Quality for Analytics Using SAS and “Applying Data Science: Business Case Studies Using SAS”. Als nebenberuflich Lehrender unterrichtet er Data Science Methoden an der Medizinischen Universität Wien, der Universität Wien und an Fachhochschulen. Sie finden auch Beitrage auf: Github und Twitter. ENGLISH: Dr. Gerhard Svolba ist Analytic Solutions Architect und Data Scientist bei SAS Institute in Österreich. Er ist in eine Vielzahl von analytischen und Data Science Projekten quer über fachliche Domains wie Demand Forecasting, analytisches CRM, Risikomodellierung und Produktionsqualität involviert. Seine Projekterfahrung reicht von der fachlichen und technischen Konzeption über die Datenaufbereitung und die analytische Modellierung in unterschiedlichen Branchen. Er ist der Autor der SAS Press Bücher Data Preparation for Analytics Using SAS®, Data Quality for Analytics Using SAS® and “Applying Data Science: Business Case Studies Using SAS”. Als nebenberuflich Lehrender unterrichtet er Data Science Methoden an der Medizinischen Universität Wien, der Universität Wien und an Fachhochschulen. Sie finden auch Beitrage auf: Github und Twitter.